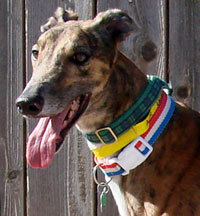 FOSTER UPDATE: Troy is blossoming from a shy boy into a loving Velcro greyhound. He needs a gentle hand, a soft voice and much petting to reassure him that he’s safe. This will help him gain confidence until he’s fully adjusted to home living. Troy would do best in a home with another medium or large size dog and people who are around most of the time. He will not do well if left alone for extended periods. Loud voices, thunder and heavy traffic noises startle him a little. When walking, his fosters recommend using a harness and short leash for better control instead of a Martingale collar in case Troy gets spooked. Troy likes kids, enjoys his car rides, and is house trained with a doggie door. Troy knows his name and accepts crating for no more than 4 hours a day.